Archivematica 1.8.1 is a legacy release, and these documents are no longer being maintained. Archivematica implements a microservice approach to digital preservation. The Archivematica microservices are granular system tasks which operate on a conceptual entity that is equivalent to an OAIS information package: Submission Information Package (SIP), Archival Information Package (AIP), Dissemination Information Package (DIP). The physical structure of an information package will include files, checksums, logs, submission documentation, XML metadata, etc. These information packages are processed using a series of microservices. 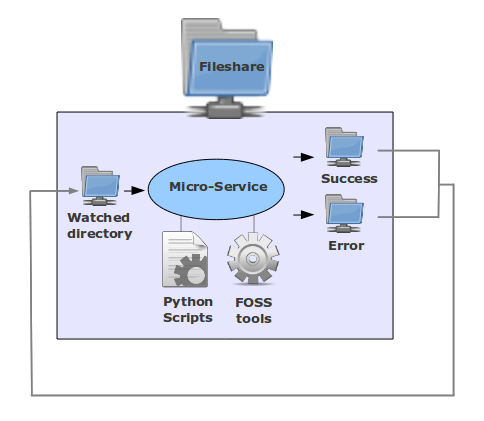 microservices are provided by a combination of Archivematica Python scripts and one or more of the free, open-source software tools bundled in the Archivematica system. Each microservice results in a success or error state and the information package is processed accordingly by the next micro- service. There are a variety of mechanisms used to connect the various micro- services together into complex, custom workflows, resulting in a complete ingest to access system. Archivematica implements a default ingest to access workflow that is compliant with the ISO-OAIS functional model. Microservices can be distributed to processing clusters for highly scalable configurations.